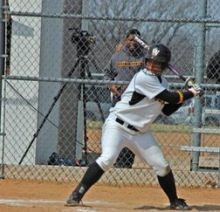 The Missouri Western softball team continues to add on to the school and conference record for wins in a row as they made it 26 in a row with a sweep of the Truman State Bulldogs. Western was able to shutout the Bulldogs in game one winning 3-0 and then hung on in game two for the 7-5 victory. Western sits at 29-4 overall and 4-0 in MIAA play. In Game 1, the Griffons never allowed a player to get past second base as they held the Bulldogs just four hits in the contest earning the 3-0 victory. In Game 2, the Griffons used a two run homerun by Mandie Nocita and a three run homerun by Becky Diehl to score the first seven runs of the ball game. The Griffons will be in action next on Saturday, April 4 when they take on the Fort Hays State Tigers in Hays, Kan. The two teams will play a doubleheader starting at 12:00 pm.